Be sure to subscribe for updates on this and all my other data analysis projects! 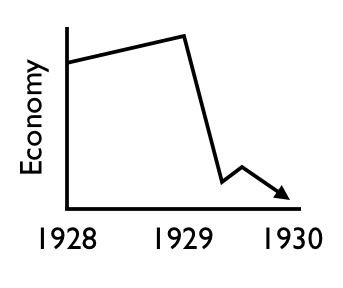 I spend a lot of my time looking at plots (aka graphs, charts, figures...) If done carefully, graphs can be informative, artistic, personal, edifying, and even clever/witty. So often they are hasty, convoluted, gritty, and confusing. Frequently you encounter figures that seem to have been made out of spite for the data, or to merely satisfy tradition in the field. There are a wealth of opinions on what constitutes a good graph, and the philosophies behind creating them. Since there is commonly little formal training for scientists in the art of visual communication à la graphs, I think there is much still be said and written on the subject. I hope to bring some outside expertise and opinions to If We Assume on this very matter. One aspect about graphs that has entranced me is their ability to tell a story. A universal tenet of effective figures is that they must tell the story better than any other medium, better than a text description, a table, or an equation. Otherwise they are redundant. By visualizing the story (actually the data) we make it more human, more digestible. It touches chords, associates with memories, and should affect us like a good parlor trick. The title of this post is a double entendre. I am presenting five plots/graphs that are famous, and have changed the world in a way. Each figure also represents a plot/story, capturing and quantifying the human saga throughout some piece of history. Most are not attractive enough to merit studying their aesthetics unfortunately. Figure 1. Napoleon's defeat in Russia, as illustrated by Charles Minard. This has been called by some the "greatest figure ever made". Besides being very easy on the eyes, it tells the story of Napoleon's catastrophic march and retreat in Russia in 1812, losing 400K men, and foreshadowing his ultimate defeat. 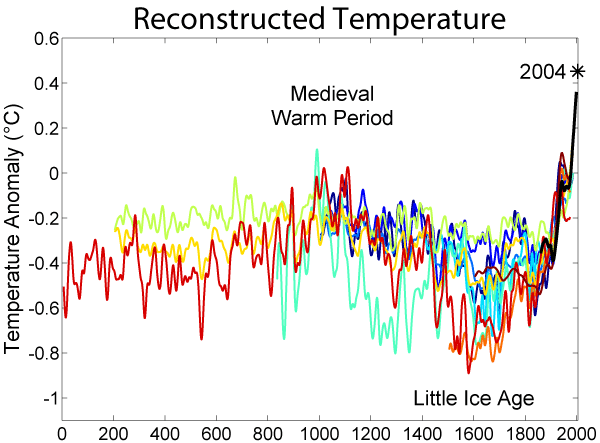 The graph contains a massive amount of data, showing landmarks and geographic course the army took, the size of the army over time, and the temperature of the bitter Russian winter. You can study this figure and gain insight as to why Napoleon lost. Figure 2. 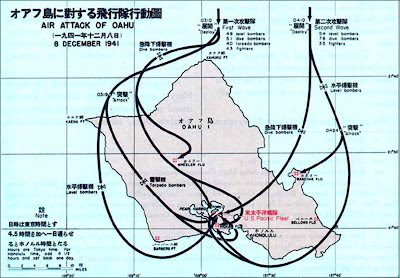 A map of the Japanese air strike on Pearl Harbor in 1941. There are great movies about the attack on Pearl Harbor, and there are terrible ones. The same can be said about all of WWII, I suppose. Undoubtedly WWII has provided us with some of the most memorable and dramatic statistics and stories of any conflict in human history. This simpler map lacks the subtlety of Minard's work above, but nicely describes the multi-pronged strategy of the Japanese attack on Pearl Harbor. The attack was devastatingly effective, and drew the United States in to the global war. dramatic global warming in the 20th century. 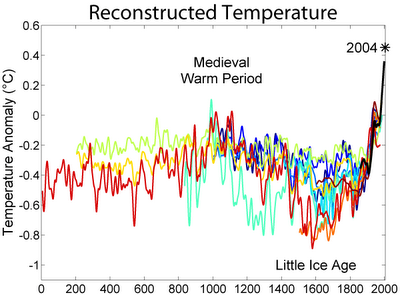 This is a version of the figure that keeps Al Gore up at night. My favorite over-the-top moment of his film was when Al gets in a scissor lift to point to the most recent CO2 readingm high above the rest of the chart and the audience. While dramatic, the demonstration was very effective, and made the story very personal. In a way it became a literal embodiment of the very problem he was discussing, that we have to raise ourselves up to overcome a problem that towers above us. This particular version from wikipedia is probably closer to what a scientist would use. It's ugly, but the point is still clear. Figure 4. 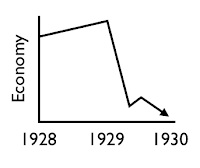 The Stock Market Crash of 1929. A simplified illustration of "Black Tuesday". 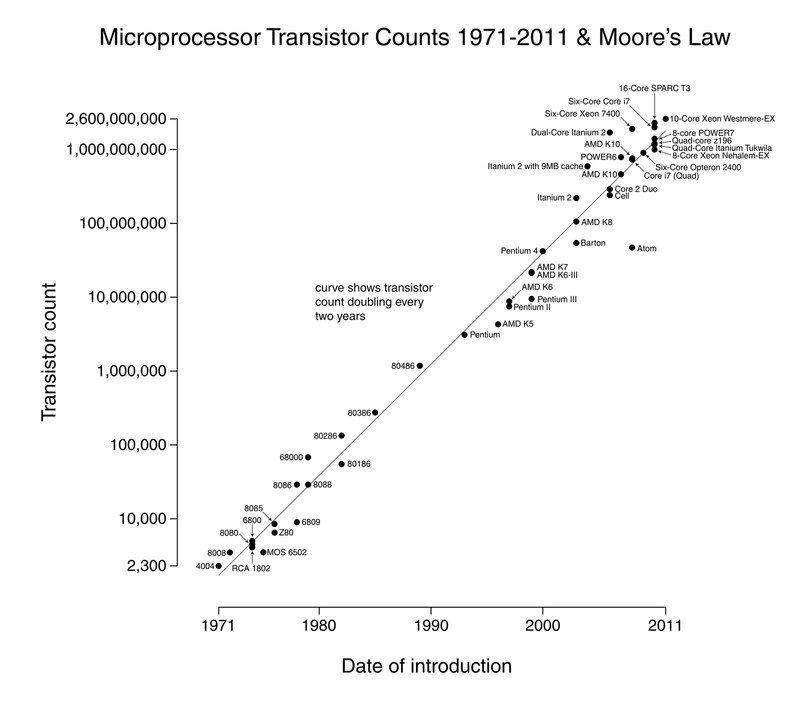 I love Moore's Law, it's the description of how my iPhone has more computational power than NASA used to go to the Moon. Many versions exist (I also like this one). The Law is really a fantastic description of the computer age as the successor to the industrial revolution. It allows us to quantitatively predict what will be possible in years to come. 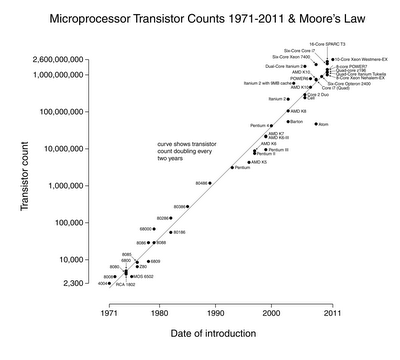 If some big questions require a certain amount of computational power not available, we only need wait a few years for hardware to catch up. Dreams like LSST depend on it, with nightly data processing volumes that seemed like science fiction when first proposed. You could make a figure like this to describe all manner of things; an exponentially improving state of affairs for the naked ape. OK, so that was 5 of my favorite historical figures presented with little commentary. In another installment I'll show some famous science-related plots. In the meanwhile, consider what effective and memorable figures mean to your daily life, and how sloppy and manipulated (read: useless) they usually are on the nightly news. Could a perfect graph spark a revolution? Part II in this post series is now up! A great comment on reddit reminded me that I should have also included the very famous "rose" figure by Florence Nightingale, a plot that definitely changed the world! Reddit has pointed out to me a BBC article from 2010 with a similar name, but of which I was unaware: Diagrams that changed the world . My submission to r/dataisbeautiful was then cross-posted (not by me) to r/MLPlounge... evidently my title was actually a triple entendre.